The EU is taking steps to reduce CO2 emissions of cars and vans. Under the revised rules, there will be stricter CO2 emission standards for new passenger cars and light commercial vehicles. A provisional agreement reached by the Presidency and Parliament representatives on 17 December was endorsed by member states today. The new rules will ensure that from 2030 onwards new cars will emit on average 37.5% less CO2 and new vans will emit on average 31% less CO2 compared to 2021 levels. Between 2025 and 2029, both cars and vans will be required to emit 15% less CO2. Today’s agreement gives the go-ahead to decarbonize and modernize Europe’s road transport. It represents an integrated approach to the transition towards low emission mobility, and supports the long-term competitiveness of the sector, including by facilitating innovation in clean technologies, such as batteries and recharging infrastructure. It makes sure that cars will emit on average 37.5% less CO2 in 2030 compared to the current emission standard limits and is therefore an important step to achieve our climate goals. In addition, we are improving the test procedures with stricter rules to ensure a reliable representation of the real world emissions. Average CO2 emissions of new cars registered in the EU will have to be 15% lower in 2025 and 37.5% lower in 2030, compared to the emission limits valid in 2021. 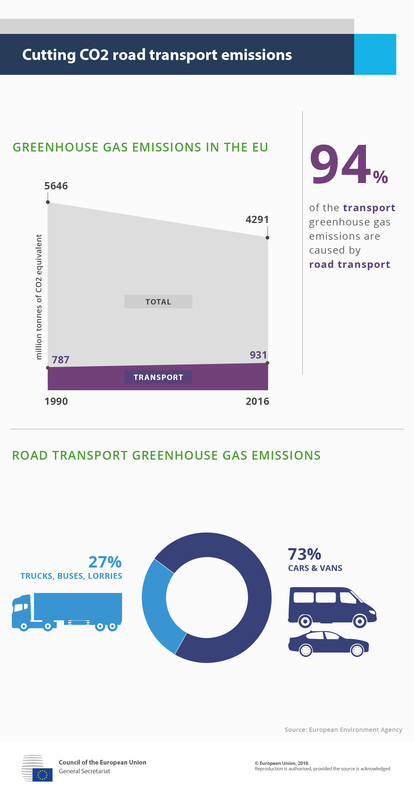 The CO2 emissions of new vans will need to be 15% lower in 2025 and 31% lower in 2030. These are EU wide fleet targets. The CO2 reduction effort will be distributed among manufacturers on the basis of the average mass of their vehicle fleet. A review clause provides for a possible revision of the 2030 targets and for the introduction of binding reduction targets for 2035 and 2040 onwards. The Parliament and the Council agreed on a mechanism to encourage the sale of more zero- and low-emission vehicles such as fully electric cars or plug-in hybrid vehicles based on the approach proposed by the Commission in its original proposal. If a manufacturer meets certain benchmarks, it will be rewarded with less strict CO2 targets. The benchmark levels for 2025 will be 15% for cars and vans, and for 2030 35% for cars and 30 % for vans. as concerns the incentive for manufacturers to sell zero- and low-emission cars in markets with a low market penetration of these vehicles, a multiplier of 1.85 was agreed. The eligibility criteria of a market share of zero and low-emission cars below 60% of the EU average was maintained but with a base year of 2017. A second eligibility criteria was introduced, namely a threshold of maximum 1000 newly registered vehicles in 2017 in the member state concerned. Finally, a cap of 5% will apply for the use of the scheme, so that if the share of zero- and low-emission vehicles in a member state exceeds 5% of newly registered cars, the incentive will no longer apply to sales into that member state. For vans, the Parliament and Council agreed to leave the Commission proposal unchanged in respect to incentives for zero- and low-emission vehicles. The niche derogation from the targets for those vehicle manufacturers which sell relatively few vehicles in Europe will be continued until 2028. The effects of the transition of the automotive sector on in particular employment will be addressed via a provision on a socially fair and just transition. The Commission is to consider the possibility of allocating revenue from the excess premiums to a dedicated fund or relevant programmes aimed at ensuring a just transition and if appropriate submit a legislative proposal by 2027. The Parliament and the Council have agreed on new rules that aim to ensure the robustness and representativeness of emissions data reported. Firstly, stricter rules have been agreed for the transition from the old NEDC test procedure to the more accurate WLTP test procedure as the basis for calculating the specific emission targets for manufacturers. Secondly, there will be an increased focus on monitoring “real-drive emissions”. The Commission will monitor the real world representativeness of the CO2 emission values based on data from the fuel consumption meters installed in new cars and vans. In order to prevent an increase in the emissions gap, the Commission is to assess the feasibility of developing a mechanism for the adjustment of the manufacturers’ specific targets as of 2030 and if appropriate submit a legislative proposal to this effect. The Commission must also as part of the review in 2023 assess the feasibility of developing real-world emission test procedures. Thirdly, there are also specific provisions on in-service conformity testing and on detecting strategies which may artificially improve the CO2 performance of cars and vans. In addition, the Commission will evaluate the possibility of developing a common EU methodology for the assessment and reporting of lifecycle emissions (life-cycle analysis) of vehicles and, where appropriate, prepare follow-up measures including legislative proposals. The Commission will review the existing European Directive on car labelling by 2020 in order to improve information to consumers, including evaluating options for introducing a fuel economy and CO2 emission label for vans. The Commission presented the proposal for a new regulation in November 2017 as part of the third clean mobility package. The European Parliament adopted its position on 3 October. The Council agreed its position (general approach) on 9 October. Negotiations with the European Parliament started on 10 October and ended in a provisional agreement on 17 December, which was confirmed by EU ambassadors of the member states today. On the European Parliament’s side, the ENVI Committee is scheduled to endorse the provisional agreement on 21 January. The formal adoption of the new rules will happen before the summer.